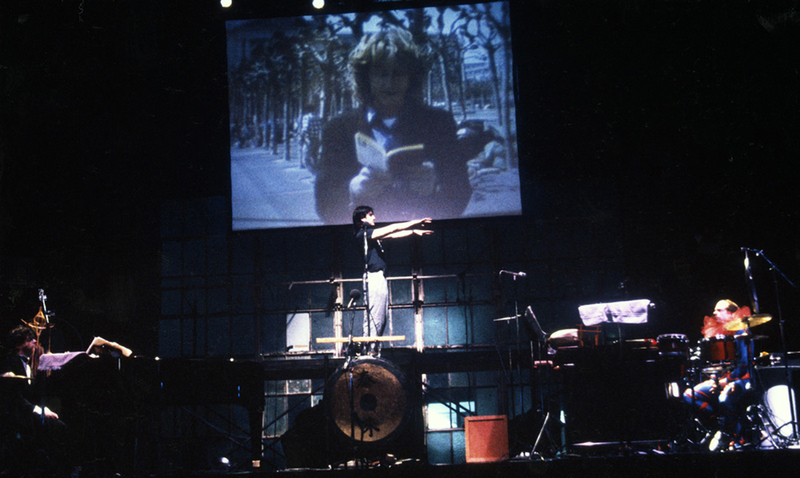 Performance of Karlheinz Stockhuasen’s Originale, May 1990 at Theater Artaud in San Francisco. From the left to right are Michael Orland, piano, Chris Maher, action musician, and Don Baker, percussion. Barney Jones is reading Marx’s Communist Manifesto on the video projection. 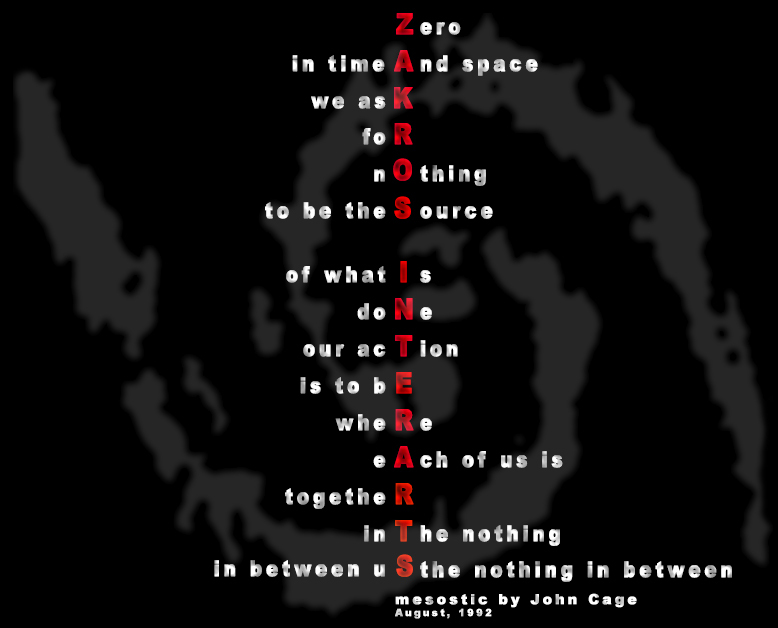 Zakros InterArts began as an arts company founded in San Francisco in the late 1980s, but has since taken shape as a personal artistic statement, a retreat from the precarious machinations of artistic venues, into a quasi-utopic, “anything is possible” artist’s museum that is only limited by ideas and the systems of the Network. The idea behind Zakros was a concept formulated on the East Coast of Crete, where the tiny Greek village of Zakros is nestled between the Mediterranean and ancient Minoan ruins. It was here I discovered the idea of a mythic culture: rising from the island of Atlantis, inspiring apocalyptic and utopian visions of generations of theorists, seekers, and dreamers. It occurred to me at the time, that when I reached the end of my tolerance for art world posturing, that I would seek out the balmy shores of ancient Crete to rediscover the roots of utopic dreams. That was in the late 1980s as I was about to return to the US after two years of post-graduate study in the underground high-tech world of IRCAM, itself nestled beneath the streets of Paris and the Musee Centres Pompidou. The experience of Zakros was the catalyst for my own quasi-mythic experiment: Zakros InterArts, which has over the years morphed from the production of multimedia theatrical works to a new kind of multimedia concept, – “the gesamtdatenwerk” – the creation of a theater edifice in the third space of the Internet. Over the past twenty-five years, Zakros has been a life-long project, documenting the experimental works I undertook beginning in my post-graduate days in San Francisco, to my current residence in the nation’s capital, where I have created my own mythic government agency. I have since spent my days and nights stalking the streets of Washington, DC looking for material for the next work, and believe me, the material is abundant! This Website has thus evolved into an ever-expanding universe of performance work, installations, music composition, manifestos, writings, mediational histories, and teaching experiments. Please explore, it’s a hypermediated tour through my life’s work, and like the ancient Greek labyrinths, it’s easy to lose yourself in the circuitous twists and turns and occasional dead ends of the artistic process. Among the most prized in my collection here, is the mesostic that John Cage wrote for me when I organized what would have been his 80th birthday concert in 1992. Although he died just before the event, he left for me what could very well be his last mesostic: a poetic musing on Zakros InterArts. Although this little gem was written many years ago, I am still deciphering its meaning. I have no doubt it bridges the ancient teachings of the Minoans with the virtual space where I now reside in the Network. I invite you to situate yourself “where each of us is together in the nothing, in between us, the nothing in between…” I’m sure John Cage was a Minoan in some faraway distant life.